Book your online reservation directly with top hotels in Lisbon Portugal - from two star, economy, budget, child & family friendly lodging, first class accommodations to superior hoteles, deluxe luxury hotels and resorts. Find downtown Lisbon hotels, midtown, business district or airport hotels using our search engine, and find the best hotels in the Lisbon area for your next family vacation, romantic weekend getaways, holiday, or business trip. Whether you're travelling on business or leisure, the modern Holiday Inn Express Lisbon Alfragide , set in the Alfragide industrial zone, offers both comfort and value so you can relax, recharge and face the day with a smile. Hotel Holiday Inn Express Lisbon Alfragide welcomes you in the spring of 2012 . Welcome to the Holiday Inn Express Lisbon Airport, a brand new modern hotel, ideally located next to Lisbon International Airport and only minutes away from FIL trade fair venue, the Pavilh?o Atl?ntico and Lisbon City Centre. Whether you re coming on a short business trip or to see the historical sights, you ll find this Budget Hotel perfectly adapted to both occasions.Lisboa Oriente, the closest train and metro station, is located a mere 5 min away (by car), and just next to it is Vasco da Gama Shopping Centre. Less than 5 miles away from the Hotel, you can find main attractions like the Lisbon Casino, the Oceanarium, Gulbenkian Museum and St. George s Castle with its astonishing views over the Seven Hills.The Holiday Inn Express Lisbon Airport offers twin bedrooms with 2 single beds for a maximum of 2 adults, and double rooms with a double bed and a sofa, where families of 2 adults and 2 children (under 18) can comfortably stay.All guestrooms are equipped with A/C, a spacious work desk, cable LCD TV and pay-tv, direct dial phone, hairdryer, ice bucket, en-suite bathtub, tea and coffeemaker (for complimentary use) and high speed internet access at a charge. Make yourself comfortable and kick off your day with an appetising complimentary continental buffet breakfast. We look forward to welcoming you. Enjoy the Holiday Inn Lisbon-Continental Hotel, centrally located between Av.Repoblica/Av.Berna, just 10 mn away from Lisbon International Airport and at walking distance from Campo Pequeno subway station, Entrecampos train station and main public bus stop.The Holiday Inn Lisbon-Continental is the ideal place for the business traveller, due to its proximity to major companies, like Syngenta, Deloitte and Ernst&Young. It takes just few minutes walking to reach the Gulbenkian Foundation or Culturgest. The International Fair of Lisbon and the Lisbon Congress Centre are just 20 mn away by train or bus.With easy access to transports, the Holiday Inn Lisbon-Continental is also suitable for leisure. 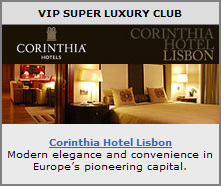 You must have dinner in a Fado restaurant, drink a coffee in Rossio or Chiado, visit Bairro Alto, Belem, S. Jorge's Castle, the Oceanarium and taste the delicious 'pasteis de Belem'!At the Continental you will find 220 rooms with contemporary design, restaurant, bar, business center, fitness center, parking, hairdresser, jewellery, gift shop and 9 meeting rooms for banquets and conferences. Wi-Fi is available in all rooms and public areas.The Holiday Inn Lisbon-Continental has an impressive reputation for providing guests a professional and friendly service, which jointly with its location and facilities make this unit the perfect hotel in Lisbon, Portugal.We are looking forward to your visit! Welcome to the Express by Holiday Inn Lisbon Oeiras Hotel! Best value for money either for business travellers or families wishing to discover Oeiras, Estoril Coast, Cascais, Sintra and Lisbon. always with our complimentary buffet breakfast. The Hotel is in Porto Salvo, close to the major business parks such as Quinta da Fonte, Taguspark, Lagoas Park, but also to the Beach, from the hotel, you can easily reach Guincho- world famous windsurf and surf spot, Estoril & Cascais Coast and the famous Estoril Race track. If you prefer a cultural break, don t miss Sintra with its Museums, and Palaces. Visit Lisbon s picturesque quarters Bairro Alto, Alfama, Mouraria or Baixa-Chiado, and experience the traditional and relaxed atmosphere of a Fado Restaurant. Twenty minutes is all it takes from the Lisbon International Airport to the hotel. All our 126 rooms are equipped with AIR CONDITIONED, Internet access, satellite TV, in-house movies, direct dial telephone, tea & coffee facilities, hair dryer, business desk.Wi-FI or High Speed internet access is available in all our rooms and public areas. If you need to use a computer, our Business Point is at your disposal 24h. For corporate meetings or business training sessions, the Hotel has 4 meeting rooms, with natural daylight; check our meet smart program. Stay Smart, Book now your stay with us! Find hotels rooms, hotel booking, hotel deals, Lisbon hotel reservation, motels, hotels cheap, hotel reservations, Lisbon hotels deals, hotel offers, booking hotels and more! !